On the Hard, close to the Dockyard gates, overlooking the harbour. 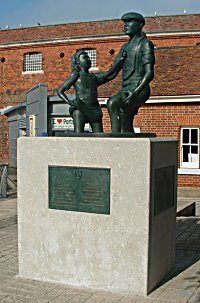 "The nearby statue commemorates the generations of Portsea children who enjoyed mudlarking here - entertaining travellers by retrieving coins they threw into the mud below the bridge to the harbour station and Gosport Ferry. Boys and girls would scramble to find the money tossed down, sometimes diving into the mud, performing handstands or dipping their heads in it. Many Portsea families lived in poverty, so the small change was welcomed. Usually, what the children did not spend on sweets or pie and chips was given to mum to help out the family finances. Most parents disapproved of their children's activities, while the police regarded mudlarking as begging and tried to stop it. Mudlarking supplemented other ways of earning a few shillings, such as carrying passengers' bags or finding drivers parking spaces. The building of the new bus terminus in 1976-7 put an end to mudlarking." The Mudlarks Memorial was paid for by private subscription by, amongst others, former mudlarks. The names of all who contributed are inscribed on the plaques attached to the four sides of the plinth.